Not far from Highclere lies Stonehenge, an extraordinary outline of the remains of architecture from c. 5,000 to 3,000 BC around which people lived, farmed and planned their lives. 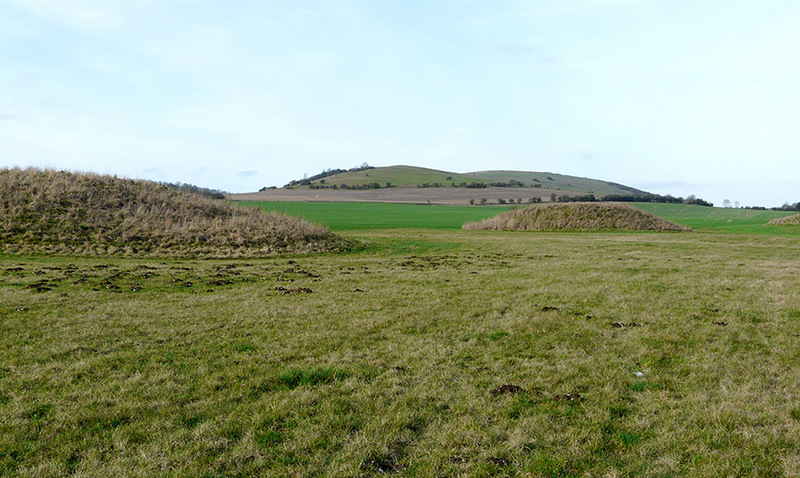 Highclere also has remains of tumuli and forts from the same period. Every time I walk there, it seems a place of timelessness with just the outline of our ancestors’ building works. Christopher Wren, an outstanding British architect who rebuilt perhaps 52 churches in London after the Great Fire in 1666 including, of course, St Paul’s Cathedral, wrote that “Architecture aims at Eternity” and sometimes, in places like Stonehenge, you really begin to feel that possibility. At the time of the great fire, Highclere was made of brick which was only later encased in stone. The current silhouette with its soaring Italianate style and pinnacles carved in the shape of obelisks reaching skywards (perhaps making their case for eternity), was shaped some 175 years after the Great Fire. Begun by Sir Charles Barry in 1842, this stone, however, is not eternal: it is Bath stone from quarries about 60 miles west of Highclere. The positive attribute was that because it was softer, it could, therefore, be carved with more intricacy. Sir Charles Barry considered Highclere to be one his favourite works commenting on it that he had created one of the most striking seats in the country. In this way, the whole construction framework of the earlier house at Highclere was retained so that the level of the windows and floors did not have to be altered at all. It was a more economical approach than starting entirely afresh. This was very different to the rebuilding of the Houses Parliament which was carried on contemporaneously with Highclere. The fire in 1834 had destroyed too much of the earlier building and since the site lay alongside the River Thames, it was irregular and challenged the desire for symmetry. The architectural character of the building was of course very different from Highclere – it was to be palatial, of “elements magnificent”, a symbol of tradition and authority and a place of procession and grandeur. It also had to be practical. It has been called the Mother of Parliaments and Winston Churchill commented in 1943 that “ We shape our buildings, and afterwards our buildings shape us”. 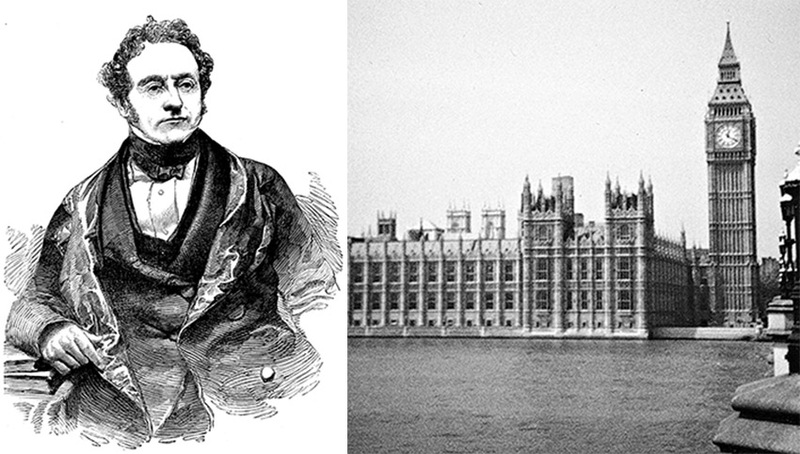 Parliament too has endless restoration works – the Anston stone chosen should have been more durable but has since been damaged by pollution. At Highclere, Geordie and I have been restoring stonework, rebuilding chimneys, re-roofing sections in stages since 2003. Whilst it sometime seems never ending, at least we started and keep going. The photos here show the last two weeks of cleaning and restoring at the end of which we have lightly washed the white bath stone with warm colour to blend it in to other stonework. That of course is the fun part. Thank you Eric and Paddy from HDC for your great work again. You can watch Eric and Paddy’s work for yourself by viewing the videos below. I just checked out your blog today and discovered another post. Your saloon is breathtaking and I now know the large portrait is of the 3rd Lord. When I enlarge the photo I can see the castle painted behind him. I would love to see your home and Stonehenge. Hope you have a nice Easter. 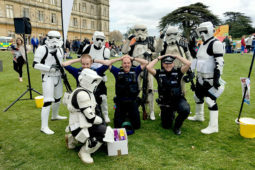 Thank you – we will be busy as Easter – we have an Easter Egg hunt in aid if a children’s hospice, Naomi House which is fun. It is a treasure hunt round the gardens and at the end each child wins and Easter Egg! I just hope the weather is ok..
How fascinating a read about that stone. I can well imagine how it must be cleaned periodically, especially because England is an island in the Atlantic. I’m sure there is salt air everywhere. I am from Hawaii where salt in the air is a problem to contend with and people have all kinds of methods. Scraping and rinsing with fresh water seems to be the best way. Happy Easter to you all. I had not realised until the stonemasons told me that the white bath stone was darkened with a zinc oxide mixture to create the “goldeney” colour with which we are so familiar today..Steaming the lions above the portico was a good job and cleared out all the moss which had collected there. I can also see what we have done which is much more encouraging! I love these tidbits of history and how it all ties in with Highclere. It’s especially fun to read as an American. Thank you! I think the chalk and hence clean water made it a good place to live. Our greatest architectural and garden treasures are, happily, in safe hands with far-sighted custodians like yourself and your husband . You are kind, some days it seems a bit of a struggle but that has not changed over years!!! Love to read your blog each month to find out what is happening at Highclere. Stonehenge and all the barrows in the Wessex area are favourites of mine. One day I would love to be able to visit your beautiful home when I visit Uk from my home in Luxor. The barrows are a the same age as the temples in Luxor – it always gives me pause for thought.. Thank you for your eye to detail…you are keeping the integrity of Highclere intact! I so want to visit and experience your world. Have a wonderful, blessed Easter. I think that it what I hope to share in blogs, videos and books! It seems as if spring fever is breaking out all over the world. As I speak with my friends in France, Norway, and in the U. K., the soap and water is flowing, the hedges are being trimmed, roses carefully pruned, and one of my favorite monikers is happening…. Make look nice. I so enjoy hearing of the work continuing at Highclere. If one owns a dwelling, there is always something to do, regardless of the size or scope of the home. If more people could feel the joy of a job well done sprucing up one’s home for the beauty of spring, the better off we all would be. Thank you for your thoughtful updates Lady Carnarvon. Melissa wrote that it seems Spring is breaking out all over the world, she forgets that some of us live on the opposite side. We in New Zealand and Australia are just now feeling the touch of Autumn in the air. Our trees are slowly starting to change but the beautiful autumn colours are yet to emerge. The wonders of the and it beautiful seasons. Seasons and a sense of place. I would like to know how far Stonehenge is from Highclere. Your home fascinates me, although I find I’m intimidated by the thought of keeping it clean. I must admit I’ve been a Downton abbey fan since the beginning which I watched to see different parts of your home almost as much as to follow the characters. Have a lovely Easter. The continuing energy that you and your husband devote to the restoration and maintenance of Highclere is to be commended. Your endeavours remind me of my old school motto “Finis coronat opus” – the end crowns the work. Although I’m not too sure whether that phrase was meant to be used where the task is never-ending, you obviously can be comforted by knowing that through every stone that is carefully (and lovingly) restored, you are leaving a legacy for all to enjoy the grandeur and architectural splendour that is Highclere. On a different topic, I have received your new book. Congratulations, it is a fine piece of work. It is beautifully presented and extremely interesting. Your writing certainly showcases the art of entertaining, past and present – in style. My family and I have thoroughly enjoyed reading it and admiring tthe splendid photography that has captured the essence of being ‘at home at Highclere’. Also, with winter just around the corner for us in the Southern hemisphere, a number of your recipes have been designated as special family dinners over the next few months.. Thank you – The photographs are beautiful. David Griffen was food photographer in the UK of the year last year and there are a lot of recipes! It is about homes and cooking and you can’t have one without the other. I thoroughly enjoy reading your blog about the history and current goings on at Highclere Castle. I can’t wait to visit in Marh next year. I’m hoping the Mother’s Day afternoon tea and tour will still be on. I have been to Stonehenge a few times and love all things English. Greetings from Queensland, Australia. I love your description of the history and on-going work of the Castle. It is truly a “labor of love”, albeit never ending! The stonework is magnificent. I wish you a blessed Easter, and many thanks for your photographs and writings throughout the year. I look forward to a visit just after Easter – such a special place to explore! You are right it is never ending but it teaches me about life, which is a journey and I will never do all I want to. I’m watching Downton Abbey again, and the castle is just an amazing character in the series. It looks so homey and comfortable, yet it is so huge. 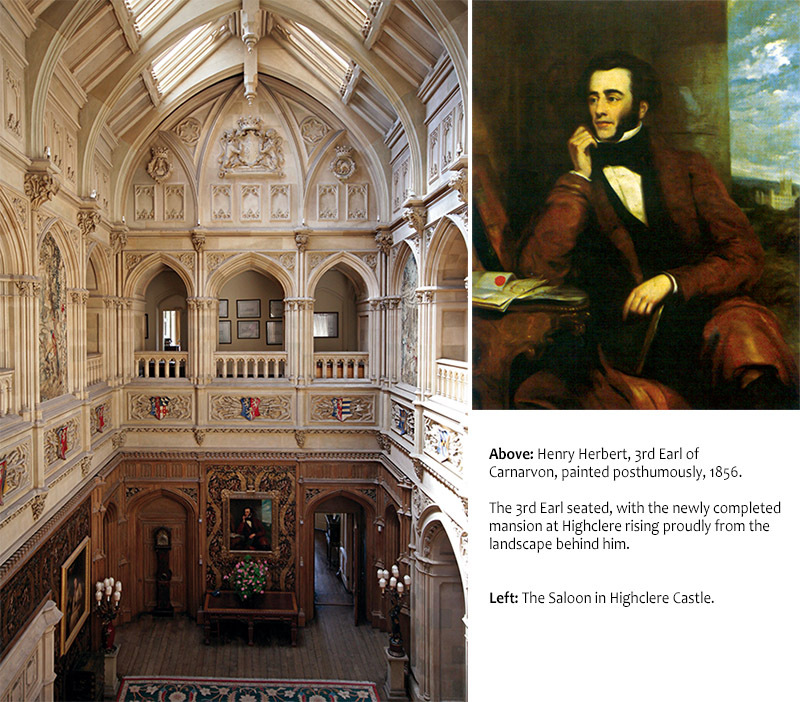 This pic in todays blog shows the majestic saloon and the pic of the Earl with the castle behind him is just awesome. What a labor of love it is to keep this “home” in shape. It makes me feel like our own home projects are nothing compared to yours….keep it coming love your blog! I should have had shares in paint companies!!! Like always I enjoy all of your blogs.Although I don’t live in or around Highclere.I enjoy reading your blogs. Especially this one, again it has shown me the undeniable beauty of Highclere castle. Please don’t give up on your blog writing,I love reading all of your blogs. We had the pleasure and privilege of visiting Highclere this past summer. It was not our first trip to the UK, but we enjoyed a return visit in celebration of our 50th wedding anniversary. We traveled from Canada. We stopped at Stonehenge first and gazed in wonder at the giant weathered stones that have endured both time and relentless elements. We never realized there was a commonality with Highclere. We then toured through your beautiful home (twice in the same day) and had a photo opp at the front door next to the great black wolf’s head knockers. We enjoyed tea outside by the Coach House, and also roamed the gardens and walked along the lengthy lavender wall (in full bloom) and sat in the Secret Garden. As we walked about I kept peeking back at the castle in awe at its dignity and grandeur, never thinking how time and pollution could damage such an architectural and historical treasure. As we sat in Jackdaw’s folly and looked back at the Castle a Shakespeare quote came to mind: “This blessed plot, this earth, this realm, this England”. 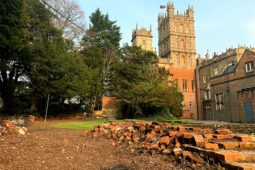 Even though the restoration of Highclere seems endless, may you and Lord Carnarvon forever be blessed with dauntless strength, determination and funds to conserve for millennium your “blessed plot”. 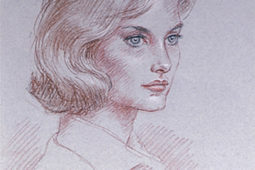 I love reading your blog and all things Highclere. My birthday is April 14th and one of my “surprise” gifts is your new book. I have your signed copies of Almina and Catherine. When the postman knocked at my door with a UK Amazon flat box, the cat was out of the bag. I can’t wait to read it, cover to cover. Happy Easter! Happy reading.. let me know what you think! With your repairs and restorations of Highclere Castle, you are the true custodians of history for future generations.Bravo! So fascinating to read the tales you tell, and soon I’ll be able to read the amazing stories in your book about “entertaining” at the Castle (which shall be arriving in Greece from AmazonUK soon!). The photos of the scaffolding and workers busy cleaning and repairing reminds me of the work continuing on the Parthenon in Athens: lots of scaffolding, and a crane, and laser cleaning going on for marble stone, which should be so strong a material “for eternity” but modern day pollution and other past events have “eaten away” bits and pieces. Keep up the good work and may you have a most lovely Easter time! Pollution is not good for us or our buildings. Happy Easter! Lady Carnarvon, I would like to wish you, your family, and your beloved animals all a Happy Easter. Easter Sunday April 16. 2017. Do your dogs hunt Easter eggs? Laugh. My dogs would hunt eggs in the grass, flip onto their backs while balancing an egg in their mouth. I have photos of these antics. Pricelessly cute it was!! Also, when will “At Home At Highclere” be ready for USA purchase on Amazon? Again, Happy Easter, the Lord Is Risen. Happy Easter to you – and I try to find any misplaced eggs before the dogs..Easter is the beginning isn’t it? Spring and Christ. “At Home” is out in the USA and Canada June 20th – it is preorder I think on the Rizzoli web site. plus wondering around on our own on your beautiful grounds, viewing sheep and meeting both the seasoned and new gardeners. You certainly are devoid to family history, art, and HighClere’s history! Thanks for the unique BLOGS. When will the Book be available in the US?? Thanks Shirley Ann Sloop Fine Bead Jewelry Designs since 1990. I know nothing about any earrings- I would have written/emailed! I am so sorry. Amy sadly left us – she had been with us for a long time and you are right we have rebuilt an office building which has been a huge project and files/papers etc got stored in a garage in a rush as the rafters in the building were unsafe .. we are nearly sorted but not yet out of the garage. Spring is a good time for gardens you are right ! I sometimes wonder why I didn’t seek a degree in History . I do so much searching into heritage, and the past. Architecture is fascinating and we often tend to go through life not taking the time to ‘look up’, so we miss a lot . We are guided by our past, so they say, and hopefully we learn from it. Your home is extraordinary, and the close up pictures really give one a chance to feel the flavors of the colors outside as well as the warmth in the saloon. By the way, I took a special liking to the first picture, as I am, shall I say, a Freelance Commercial Artist (not professional), and my specialty is pen and ink. That is a most magnificent rendering, very complicated, and very beautifully done. Thank you again for ‘sharing’. Will the new book you mentioned be made available on line, or should I say it another way, since it will be ‘limited edition’ could you save one for me, please?! I would be forever in your debt, as they say, and would pay you whatever you ask . I’m afraid ‘across the pond’ is not in my schedule right now. I can imagine it will be a wonderful book though. I have been a commercial artist for many years, and this sounds fascinating. Are there any plans to open the tower to the public? The views from the roof look marvellous, would be lovely to have afternoon tea on the roof of the tower overlooking the castle grounds and the estate. I’m sure if the exterior of the castle got sandblasted it would look as it did back when it was completed, would be breathtaking to see I’m sure. I do have (a cunning) plan … !!! Seriously I do have a plan for the lower rooms in the tower – it really is a climb up to the very top however but I thought I might figure out a prize for some lucky reader of my new book etc …. I was so impressed done by the stonemasons on the exterior of Highclere. They did a wonderful job. I would agree with Sir Charles Barry that Highclere is an absolute treasure. It is perhaps the most beautiful stately home in England. I have to tell you that I toured Buckingham Palace while in England. I thought that no place in the world could beat the Palace for beauty. However, when I saw Highclere later in my travels I began to question my earlier opinion!! . Speaking of living like a Queen, your book on entertaining at Highclere was enchanting. The historical anecdotes are fascinating, and your recipes are delicious, nutritious and elegant. I enjoyed the book immensely and hope you write more autobiographical books. You are every bit as fascinating as Almina and Catherine, I assure you!! I wish you a lovely and blessed Easter and best wishes to your family. You are kind – the latest book does have many layers and I think the photographs are beautiful too. I must say I really liked this article! I am really interested in History but I am also very fond of architecture. (In fact next year I’ll be studying architecture at the EPFL in Lausanne). In my opinion Highclere is somehow a magnificent mix of History and Architecture, and I find it very inspiring. The way it was renovated by Charles Barry is the perfect methaphor to understand the changes that happened in the british aristocracy and this is why it is a treasure. I have never seen a building whose architecture told us so much about History. It’s like the perfect cover to the perfect book. And in a world where people tend to focus on modern technology and to look only ahead of their time, I find it amazing that some of those people are still able to learn from their past, to keep it and care for it! Anyways I firmly hope , when I get my architecture degree ( in a long long time) that I’ll be able to work on such buildings and learn from them ! Canadian here from Vancouver. Glad you are doing restorative work after years of neglect. I hope the British government is helping with costs. The gargoyles on the towers seem to have melted from erosion. Is there anything you can do besides washing off the residue, such as partnering with a master stonemason who could refashion new ones from the original specs? Hoping it was a sunny and warm Easter holiday at Highclere and now the grounds are in full bloom and ready for visitors. This morning, “At Home at Highclere” has just been delivered from Amazon.UK! And I have already paged through it and read some passages. What an amazing publication! or under the Cedar of Lebanon with Henry James on a sunny afternoon for tea. private tour of Highclere Castle in April, 2015. And about those chicks and chickens in the coup at Highclere? Your writing is fabulous, and makes me feel right “at Home at Highclere”! Thank you, and do continue with more publications …perhaps a book on the “Treasures of Highclere”, the stories behind the famous portraits, paintings, books, chinaware, and even the “Secrets of Highclere”.